Sean McFate is here today to answer questions about his new book, Shadow War. The book is largely based on his experiences all over the world. Q. How did your experiences in international relations inform the storyline in Shadow War? What can your characters do that you couldn't? 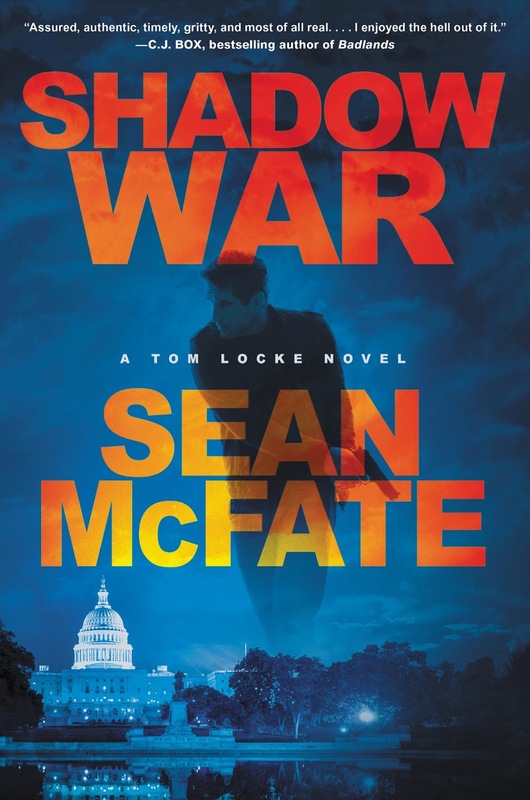 SHADOW WAR began as a memoir and ended as a novel. Tom Locke, the main character, is semi-autobiographical: a child music prodigy turned Ivy-League paratrooper turned private military contractor (mercenary to many). He’s me, had I remained in Africa, and he has the scars to prove it. I’m much happier not living that life anymore, although sometimes I miss it. Peter, my agent, told me to make it fiction. He said that way I wouldn’t get sued by my former employers, have the US government come after me for potentially leaking classified information and have more fun with the story. I struggled at first. I have written a lot, but never fiction, so Peter paired me up with Bret Witter, who has co-authored several bestsellers, including Monuments Men. Bret is awesome. The plan is I become a solo writer, but for now we make a great team. Q. Why did you choose the settings that you did? 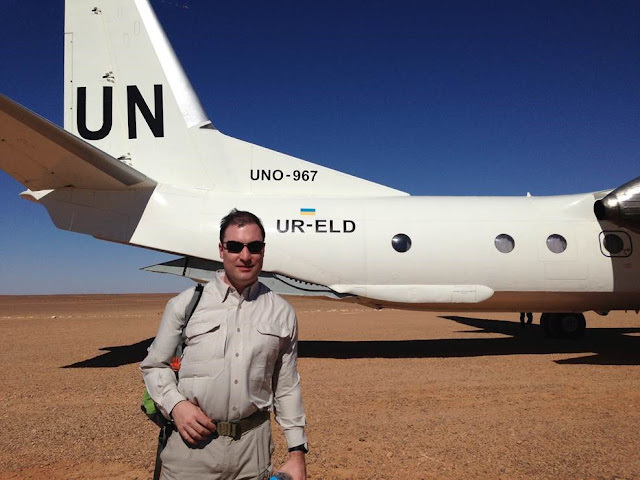 When I worked in the private military industry, I was based in Africa. I built small armies for US interest, demobilized warlords, did arms deals in Eastern Europe, helped stop a genocide and other operations. Shadow War takes place in Libya, Ukraine, Washington DC, New York, Houston and London. I know north Africa fairly well and this scene is based on an actual planned operation. Ukraine is an example of the kind of shadow wars that occur all over the world, often behind the headlines. The book is based on actual events there. Washington DC is the hub of American power, and has its own interior topography. I live here now, and wanted to share some of this landscape, invisible to the tourist’s eye: the power bars and restaurants that people go to hash out secret deals, the boutique consulting firms on K Street that and do weird things, how lobbyists create fake grassroots movements (called “astroturf”) to push politicians, etc. DC may be the capital of the US, but Houston is the capital of the global energy industry, and a major international power in its own right. Same with New York City and London. I wanted to show the connections between business interests and national interests, as a way of explaining some of the more perplexing global events. All of these places show the complexity of today’s international environment; it’s not the world we read about in high school civics class. The Fortune 500 are more powerful than most countries, and so is the UN, Amnesty International, the super-rich and others. They use their power too. I have a PhD in international relations from the London School of Economics, and the complexities are greater than most think. SHADOW WAR seeks to capture some of this rich and confusing reality, set in an international action thriller. Q. What is the best thing that has happened to you as a result of your writing? Writing is fun. It’s also informative. You don’t really know what you know, until you write it down. I also enjoy meeting readers, and connect with people. Q. What authors influence you? Who do you like to read? In terms of fiction, I’ve long been a fan of Graham Greene. I even toasted him at his favorite bar in Saigon, the Hotel Continental. My favorite book was The Quiet American. In some ways, Locke is similar to Fowler: disengaged and unsympathetic to the burning world around him. This is a moral failing. He stands in contrast to Chad Hargrove, based on someone I know. He’s a green CIA officer, fresh from the “Farm,” where the Agency trains its operatives in Virginia. Hargrove is like Pyle: an idealist, the kind that starts wars in the name of liberty and democracy but unleashes tyranny and destruction. This is also a moral failing. Things change, of course, for both Locke and Hargrove. The Quiet American should be mandatory reading for all CIA case officers. Q. Why was this the book that you wanted to write? Fiction is a great platform for truth. LeCarre’s novels pulled back the veil on the Cold War, showing the shadow wars taking place all around us, all the time. I hope Shadow War can do the same for the post-Cold War world. Wow, what a fascinating life this author has led. I love to read background on the real life experiences that shape the writing of a book. This sounds really interesting.